Seattle is known for its beautiful layers of grey surrounded by striking pops of color. This sweater was designed to capture the essence of the city and incorporate the surprises of color that nature has to offer. Each section of the sweater has its own identity. The sleek lines of the back bring a sense of streamlined architecture, and the simple cabled panel in the front implies a passion for art and fluidity. The sleeves are the statement maker -- just when you thought life was as to be expected -- look again. The pattern is highly adaptable: you can change the color scheme, or decide the front and the back will both have the twisted rib panel and leave the cabling off altogether. Swatching is important with this pattern. First, if you choose to play with colors, you'll need to test how they look against each other in real life. Also, Quince and Co Lark yarn grows quite a bit in wet blocking, so to have an accurate size, it's important to check gauge on plain knit fabric that has been wet blocked. 2/1 RC: Sl 1 to cn and hold in back, k2; k1 from cn. 2/1 LC: Sl 2 to cn and hold in front, k1; k2 from cn. 2/1 RPC: Sl 1 to cn and hold in back, k2; p1 from cn. 2/1 LPC: Sl 2 to cn and hold in front, p1; k2 from cn. 2/1/2 RC: Sl 3 sts to cn and hold in back, k2; sl 1 from cn back to LH ndl and purl this st, then k2 from cn. Row 1 [RS]: (K1tbl, p1) to end. Row 2 [WS]: (K1, p1tbl) to end. Row 1 [RS]: P3, 2/1 RC, p1, 2/1 LC, p3. Row 2 [WS]: K3, p3, k1, p3, k3. Row 3: P2, 2/1 RC, p1, k1, p1, 2/1 LC, p2. Row 4: K2, p3, k1, p1, k1, p3, k2. Row 5: P1, 2/1 RC, (p1, k1) 2 times, p1, 2/1 LC, p1. Row 6: K1, p3, (k1, p1) 2 times, k1, p3, k1. Row 7: 2/1 RC, (p1, k1) 3 times, p1, 2/1 LC. Row 8: P3, (k1, p1) 3 times, k1, p3. Row 9: K2, (p1, k1) 4 times, p1, k2. Row 10: P2, (k1, p1) 4 times, k1, p2. Row 11: 2/1 LPC, (p1, k1) 3 times, p1, 2/1 RPC. Row 12: K1, p2, (k1, p1) 3 times, k1, p2, k1. Row 13: P1, 2/1 LPC, (p1, k1) 2 times, p1, 2/1 RPC, p1. Row 14: K2, p2, (k1, p1) 2 times, k1, p2, k2. Row 15: P2, 2/1 LPC, p1, k1, p1, 2/1 RPC, p2. Row 16: K3, p2, k1, p1, k1, p2, k3. Row 17: P3, 2/1 LPC, p1, 2/1 RPC, p3. Row 18: K4, p2, k1, p2, k4. Row 19: P4, 2/1/2 RC, p4. Row 20: K4, p2, k1, p2, k4. Note: Sleeves are worked in rev St st (St st, with purl side on RS), with intermittent rows of CC to form stripes. Break yarn at end of Rows 15 and 16; do not carry yarn up sides of sleeve. Row 1 [RS]: With MC, purl. Row 2 [WS]: With MC, knit. Rep Rows 1-2 six times more. Row 15 [RS]: With MC, purl. 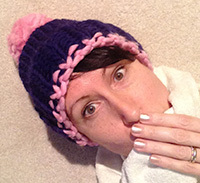 Row 16 [WS]: With CC1, knit. 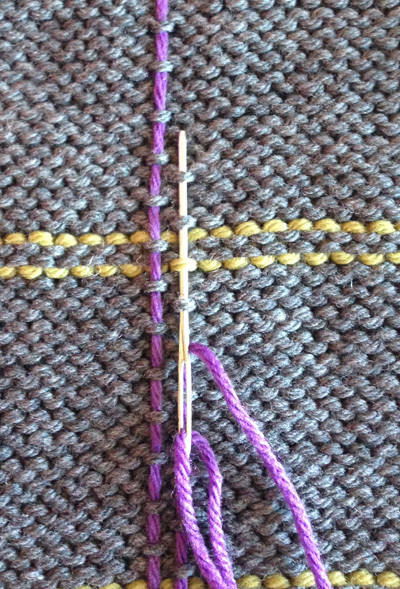 Rep Rows 1-16 for patt, working any increase rows in color as designated by Sleeve Pattern. With smaller needles and MC, cast on 66[74, 82, 90, 98, 106, 114] sts. Work in Twisted Rib for 3 inches, ending after a WS row. Next row [RS]: P2[1, 5, 4, 3, 2, 6], k1tbl, (p9, k1tbl) 6[7, 7, 8, 9, 10, 10] times, p3[2, 6, 5, 4, 3, 7]. Next row [WS]: K3[2, 6, 5, 4, 3, 7], (p1tbl, k9) 6[7, 7, 8, 9, 10, 10] times, p1tbl, k2[1, 5, 4, 3, 2, 6]. Rep last 2 rows 7[7, 7, 8, 9, 10, 11] times more, or until piece measures approx. 1.5 inches shorter than desired length to narrowest point of waist, ending after a WS row. Dec row [RS]: P1, p2tog, patt to last 3 sts, p2tog, p1. 2 sts dec'd. Work even in patt for 3 rows, then rep Dec row once more. 62[70, 78, 86, 90, 102, 110] sts. Work even in patt for 7 rows. Inc row [RS]: P1, pfb, patt to last 2 sts, pfb, p1. 2 sts inc'd. Work even in patt for 3 rows, then rep Inc row once more. 66[74, 82, 90, 98, 106, 114] sts. Continue even in patt until piece measures 16 inches from cast-on, or desired length to armhole, ending after a WS row. Keeping in patt as possible, BO 3[4, 5, 6, 7, 7, 8] sts at beg of next 2 rows, then BO 2[3, 3, 3, 3, 4, 4] sts at beg of foll 2 rows. 56[60, 66, 72, 78, 84, 90] sts. Dec 1 st at each end of every RS row 3[3, 4, 5, 6, 7, 8] times. 50[54, 58, 62, 66, 70, 74] sts. Cont even in patt until armhole measures 7.75[8.25, 8.75, 9.25, 9.75, 10.25, 10.75] inches, ending after a WS row. Bind off all sts. With smaller needles and MC, CO 66[74, 82, 90, 98, 106, 114] sts. 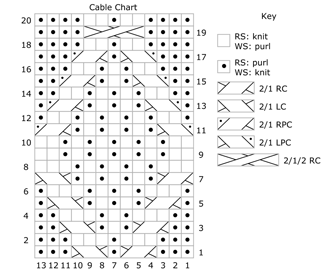 Row 1 [RS]: P9[12, 13, 15, 17, 21, 23], pm, work Row 1 of Cable Chart over next 13 sts, pm, purl to end of row. Row 2 [WS]: Knit to m, work Row 2 of Cable Chart, knit to end. Continue in rev St st and Cable Chart as set for 14[14, 14, 16, 18, 20, 22] rows more, or until piece measures same as BACK to beginning of waist shaping, ending after a WS row. Dec row [RS]: P1, p2tog, patt as est to last 3 sts, p2tog, p1. 2 sts dec'd. Work even in patt for 3 rows more, then rep Dec row once more. 62[70, 78, 86, 94, 102, 110] sts. Work even in patt for 3 rows more, then rep Inc row once more. 66[74, 82, 90, 98, 106, 114] sts. Continue even in patt until piece measures same as BACK to armhole, ending after a WS row. Keeping in patt, BO 3[4, 5, 6, 7, 7, 8] sts at beg of next 2 rows, then BO 2[3, 3, 3, 3, 4, 4] sts at beg of foll 2 rows. 56[60, 66, 72, 78, 84, 90] sts. Continue in pattern until armhole measures 4.5[5, 5.5, 5.5, 6, 6, 6.5] inches, ending after a WS row. Next row [RS]: Patt 19[20, 22, 24, 25, 26, 28] and place these sts on holder for left neck and shoulder. Bind off next 12[14, 14, 14, 16, 18, 18] sts for center neck, patt to end. 19[20, 22, 24, 25, 26, 28] sts rem for right neck and shoulder. Cont in patt, BO 0[0, 0, 3, 3, 3, 4] sts at beg of next 0[0, 0, 1, 1, 1, 1] RS row(s), then 2 sts at beg of foll 2[2, 2, 1, 1, 1, 1] RS row(s). Dec 1 st at beg of every foll RS row 1[1, 3, 3, 3, 3, 3] time(s). 14[15, 15, 16, 17, 18, 19] sts rem. Cont in patt until piece measures same at BACK to shoulder, ending after a WS row. Bind off. With WS facing, join yarn to sts held for Front left neck and shoulder. Keeping in patt, BO 0[0, 0, 3, 3, 3, 4] sts at beg of next 0[0, 0, 1, 1, 1, 1] WS row(s), then 2 sts at beg of foll 2[2, 2, 1, 1, 1, 1] WS row(s). Dec 1 st at end of every foll RS row 1[1, 3, 3, 3, 3, 3] time(s). 14[15, 15, 16, 17, 18, 19] sts rem. Cont in patt until piece meas same at BACK to shoulder, ending after a WS row. Bind off. With smaller needles and MC, cast on 28[30, 32, 36, 38, 42, 44] sts. 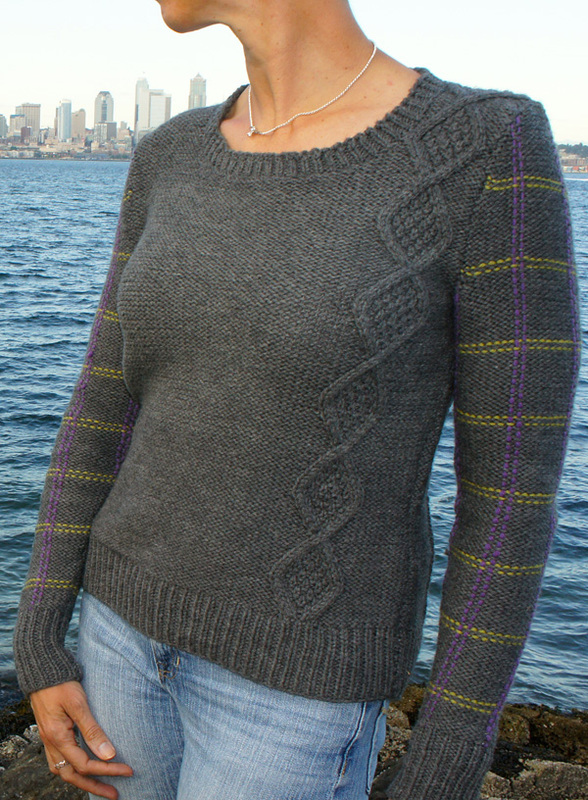 Work in Twisted Rib for 4 inches, ending after a WS row. Change to Sleeve Pattern and work 3 rows. Inc row [WS]: K1, M1R, knit to last 2 sts, M1L, K1. 2 sts inc'd. Work in patt for 7[7, 7, 5, 5, 5, 3] rows. Rep last 8[8, 8, 6, 6, 6, 4] rows 7[8, 9, 10, 11, 12, 13] more times. 44[48, 52, 58, 62, 68, 72] sts. Work in patt until sleeve measures 16.5[17, 17, 17, 17.5, 17.5, 18] inches from cast-on or desired length to armhole, ending after a WS row. Keeping in patt, BO 3[4, 5, 6, 7, 7, 8] sts at beg of next 2 rows, then BO 2[3, 3, 3, 3, 4, 4] sts at beg of foll 2 rows. 34[34, 36, 40, 42, 46, 48] sts. Dec 1 st at each end of every RS row 3[5, 3, 4, 5, 5, 5] times. 28[24, 30, 32, 32, 36, 38] sts. Dec 1 st each end of every 4th row 3[3, 3, 2, 1, 1, 1] time(s), then every RS row 8[7, 10, 12, 13, 14, 15] times. BO rem 6[4, 4, 4, 4, 6, 6] sts. 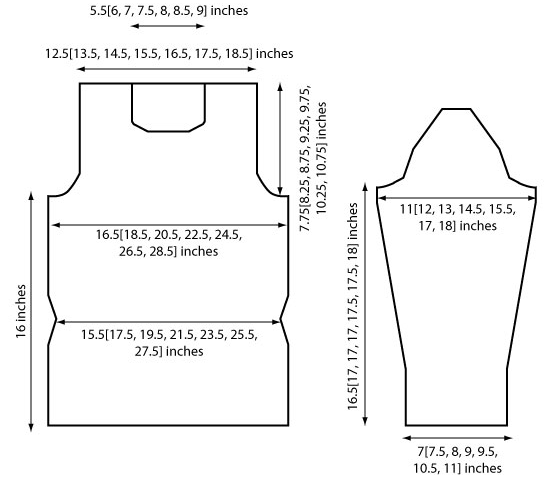 Block pieces to measurements and seam shoulders. With smaller circular needle, pick up and knit 10[10, 12, 14, 14, 16, 16] sts from left front neck to first bind off, 20[22, 22, 24, 26, 28, 30] sts from front neck bound off sts, 10[10, 12, 14, 14, 16, 16] sts to shoulder seam, and 22[24, 28, 30, 32, 34, 36] sts across back neck. Join to work in the rnd. 62[66, 74, 82, 86, 94, 98] sts. Rnd 1: (K1tbl, p1) around. Rep this rnd until neckband measures 1 inch from pick up. Bind off loosely with larger needle. Using photo at right for guidance and with RS (purl side) of sleeve facing, identify the 2 center sts of sleeve at sleeve cap. Take one length of CC2, thread on tapestry needle, and pull yarn through one column of purl sts down the top of the cuff. With another length of yarn, repeat for the other center column. Repeat process each side of this column, leaving 9 sts of plain MC in between columns of CC2. Continue to work the stripes along the inner arm area as the increases allow for it, in order to have a full "grid" of the pattern. DO NOT carry the ends for the stripes through -- this will create a tension problem on the finished sleeves. Set in sleeves. Sew sleeve and side seams. Weave in ends; the vertical stripes will have a different tension, so take care when weaving in ends not to pull them too tightly. Use the seams to hide the ends to create less bulk. 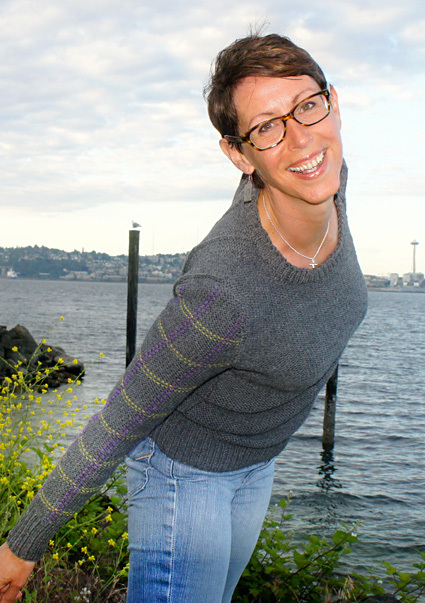 Leah (aka SeattleSpinner) works at a large non profit organization, but in her off hours she spends way too much time thinking up designs for spinning yarn, knitting, and weaving. Her inspiration is heavily influenced by the great outdoors near Seattle. Stop by her blog and hang out!